During planning we had booked a band to perform for 4 hours. Partnered with the local Farmer's Market and had arranged for vehicle placement around the stage and farmers market area with heavy foot traffic. We had the Mayor and Commissioner's set to open the ceremony. Unfortunately, the day of the event a Nor'easter (heavy rain storm) hit Central Florida, which caused the band, Mayor and Farmer's Market to cancel. The Electric Car event occurred, as planned, thanks to the dedication of the local EV community and EV dealers from Tesla, Ford, Chevy and Mitsubishi. Many people planning to attend the Farmer's Market and others from the community that wanted to learn about electric transportation attended and it was a GREAT success. We received coverage from three leading local media outlets and all stories were positive. The city was happy with the turnout and offered to host the event anytime in the future. Catch the latest Buzz on Electric Transportation and Get Charged-Up during Metro-Orlando’s Electric Auto Showcase. 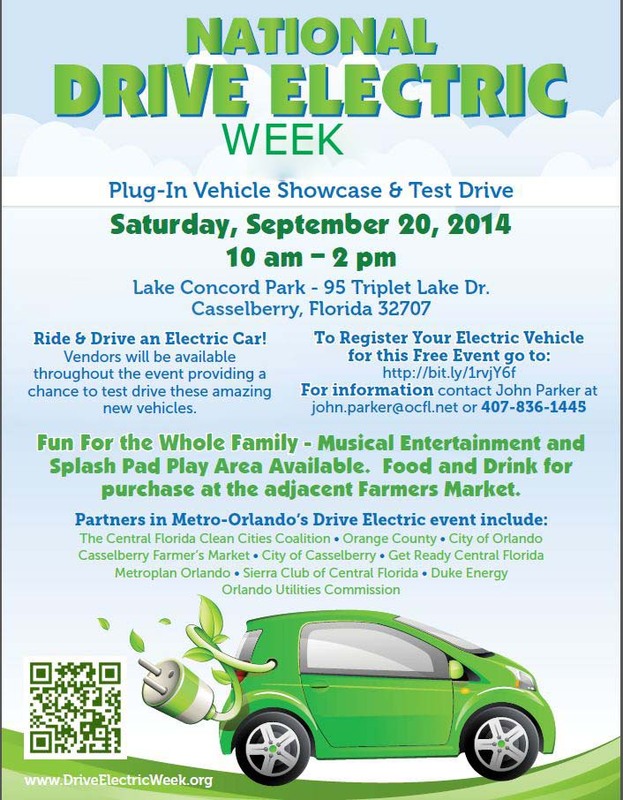 Join us on Saturday, September 20, 2014 from 10am – 2pm, next to the Farmer’s Market at Lake Concord Park (Casselberry City Hall), as we celebrate National Drive Electric week. Nearly 100 cities nationwide will be hosting similar events to promote these cleaner, quieter, economical and highly efficient vehicles. Hear from industry experts and vehicle owners about on how these vehicles operate, reduce refueling and operating expenses and are genuinely fun to drive. Never pump gas again - hear from the utilities and charging station experts about the benefits of charging at home and how to locate and use one of the over 300 public fast-charging stations located within a 70 mile radius of downtown Orlando. There are several public charging stations within a five mile radius of this event and free Level 1 charging available during the event. Test Drives - Fun For The Whole Family - Musical Entertainment and Spash Pad Play Area - Enjoy the classic rock music of Spitfire while you test drive a Nissan, Chevy, Ford, Mitsubishi, or Tesla EV around Lake Concord Park. Talk with vehicle owners about their ownership experiences and learn about the Total Cost of Ownership. Dealers will provide sale and leasing options. In addition to the Drive Electric week festivities - we will also be celebrating Pollution Prevention Awareness week, focused on sustainability and reducing landfill waste. Food and Drink will be available for purchase at the adjacent Farmers Market. Information on solar power and free solar charging will be discussed. Information on electric vehicle charging, EV technology, pollution prevention and clean transportation will be available at display tables. National Plug-in Day, now Drive Electric Week was launched in 2011 by Plug-In America, the Sierra Club and the Electric Auto Association. The idea is to bring together drivers and advocates to share their experiences with electric vehicles and how they are changing American driving. There are now nearly 50 plug-in vehicle models for sale in the U.S., and their popularity has been growing rapidly. There are currently 201 attendees registered. Registered attendees report 605,390 electric miles driven. Drive Electric Florida Coalition New Website Launched - Members Attending Casselberry Event!